E Condos is the latest two-tower project from Bazis Inc., Metropia and RioCan and it is located in the northeast corner of Yonge and Eglinton, Toronto. There is a reason that E Condos is considered to have an amazing midtown location, and it is expected to reinvigorate the Yonge and Eglinton area. The project is going to be built around an open piazza that is going to blend the condominium in with the neighborhood and surrounding street life. 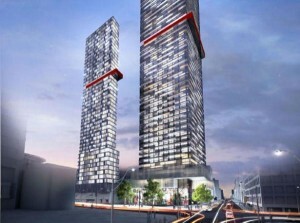 E Condos will have “golden-mile” high-end retailers located at ground level, and a lower-level retail concourse that will have a direct connection to Eglinton TTC station and the Yonge Eglinton center across the street. The project will also benefit from the new light rail line that is currently under development along Eglinton. This development is going to add a level of sophistication and luxury to Yonge and Eglinton that will help take one of the city’s most important intersections to the next level. Both of the E Condos towers will offer an extensive array of amenities. The 695 suites range from efficiently laid-out 480-sq.-ft. one-bedroom units to spacious 1,200 + sq.-ft. two-bedroom-plus-den residences with oversized terraces. The prices start in the low $300,000s. E8 will be located at 8 Eglinton East and will have a 30-foot-high lobby and a fourth-floor party room with separate lounge, international gourmet kitchen and dining room with separate kitchen. The fourth- floor amenity level will also include an extensive array of amenities. E15, located at 15 Roehampton, has a stunning 20-foot-high lobby all to itself, will have a party room with outdoor lounge, and a dining room with separate kitchen. Both towers will have magnificent cantilevered glass pools that dramatically extend out at the 31st floor, offering swimmers and sunbathers breathtaking views of the city below and beyond. There will also be an intimate lounge area, with a bar and saunas. -Wrap-around outdoor terraces with BBQ, dining tables, sunbathing beds, bar and lounge seating.